Permissions are part of the membership logic and determine the resources and features available for each user role within a plan. For example; a buyer only role and associated plan would be tied to the buyer only permissions which block out all selling abilities in the marketplace. Another advantage of permissions is the power to separate and assign different levels of membership plans along with ranging costs for the access to the marketplace. Create new permissions group, enter a title and description, click the wheel icon to add your access permissions / limits. 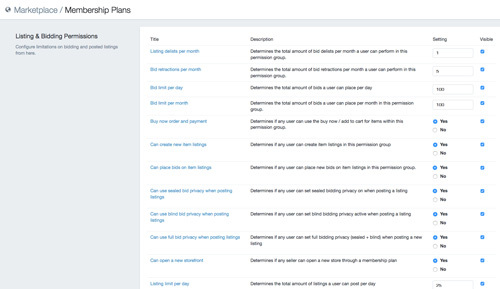 The column titled Visible with check boxes determines which permissions will show in the View Access pop up which is shown to guests who are looking at the membership plans. If you check this off, the permission will show, example shown below. In the instance when a member will not be charged for certain fees or wants to purchase additional bid limits or simply wants to purchase a service or add new resources to their plan, you can add permission exemptions allowing members to pay for additional access or not pay at all.